Rhiannon started her nursing career at Animal Emergency Service in 2009 in Kennel Attendant role. She always knew she would work with animals, after immersing herself during high school years at the school farm.Completing her Certificate IV in Veterinary Nursing within the first year of being a Kennel Attendant, she progressed to working as nurse for the next few years, developing her skills in emergency nursing. Eventually, Rhiannon went on to complete a Diploma of Emergency and Critical Care Veterinary Nursing in 2017. 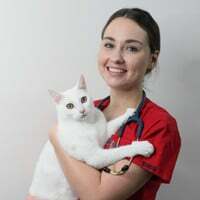 You’ll now find Rhiannon working mostly in the Pet Intensive Care Unit, where she has found her passion for critical care nursing and minute-to-minute care.At home, Rhiannon has a spoilt cat called ‘Peaches’, who prefers her life as an only child. In her spare time, you’ll catch Rhiannon either relaxing with yoga or seeing live music.